TV with Thinus: BREAKING. MultiChoice, the SABC and Viacom International's MTV to broadcast the Global Citizen Festival in South Africa in December across the continent and globally. BREAKING. MultiChoice, the SABC and Viacom International's MTV to broadcast the Global Citizen Festival in South Africa in December across the continent and globally. MultiChoice, the SABC, Viacom International's MTV and YouTube have picked up the broadcasting rights of the upcoming Global Citizen Festival: Mandela 100 with the SABC, MTV (DStv 130) and YouTube that will broadcast the event in South Africa, sub-Saharan African and globally to 180 countries across six continents on 2 December. MultiChoice has the responsibility to film and produce the event and to provide the live broadcast to the South African public broadcaster, as well as other international broadcast partners. MultiChoice will broadcast the Global Citizen Festival: Mandela 100 on DStv channel 199 to all DStv subscribers in South Africa and across sub-Saharan Africa. 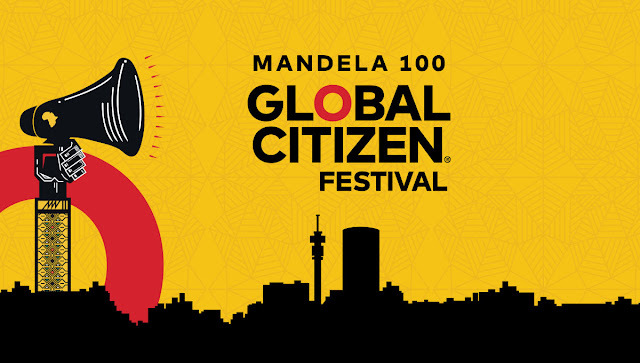 Viacom International Media Networks (VIMN) will also broadcast the Global Citizen Festival: Mandela 100 taking place at the FNB Stadium in Soweto, South Africa to 180 countries and territories outside the United States, including Australia, Argentina and beyond. MTV Base (DStv 323) will also broadcast a 2-hour "best of" TV special in the days after the original live broadcast on DStv in South Africa as well as nearly 50 countries across sub-Saharan Africa. YouTube and Twitter will bring the Global Citizen Festival: Mandela 100 to the rest of the global audience. The South African comedian Trevor Noah will co-host the Global Citizen Festival: Mandela 100 with Naomi Campbell, Dave Chappelle, Sir Bob Geldof, Gayle King, Bonang Matheba, Nomzamo Mbatha, Tyler Perry, and Forest Whitaker, and Oprah Winfrey will do a keynote address about Nelson Mandela and his legacy. Stars like Beyoncé and Jay-Z, Cassper Nyovest, D'banj, Ed Sheeran, Eddie Vedder, Femi Kuti, Kasey Musgraves, Pharrell Williams, Chris Martin, Sho Madjozi, Tiwa Savage, Usher and Wizkid are set to perform. Yolisa Phahle, MultiChoice CEO for general entertainment, says "We're honoured to be the exclusive pay TV broadcast partner in Southern Africa for this event that celebrates Madiba's legacy and reminds us all of the importance of giving back to our communities. We look forward to sharing this with our customers on the 2nd of December, and also giving them access to the musical highlights in the days thereafter". Madoda Mxakwe, SABC CEO, says "The SABC is proud to partner with the Global Citizen Festival, which will enable the public broadcaster to bring the symbolic Mandela 100 concert to South African audiences". "As we celebrate Nelson Mandela's centenary, we are pleased that this partnership will provide an opportunity for South Africans to reflect on Nelson Mandela‘s life and times, and promote his legacy." Bruce Gillmer, Viacom’s global head of music and talent and co-brand lead for MTV International, says "MTV stands with the artists, leaders and passionate citizens who are raising their voices and taking action to effect positive change throughout the world". "In the spirit of Nelson Mandela, MTV believes in the power of music to unite and inspire. We're proud to amplify this incredible night of music and activism in his honor to fans around the world." The Global Citizen Festival: Mandela 100 executive producers are Dr. Precious Moloi Motsepe, Patrice Motsepe, Kweku Mandela, Dave Holmes, Declan Kelly, Liza Henshaw and Hugh Evans. Leaders who will be speaking at the event include South African president Cyril Ramaphosa; Amina J. Mohammed, deputy secretary-general of the United Nations; prime minister Erna Solberg of Norway and president Nana Akufo-Addo of Ghana. Other leaders who will speak include president Mokgweetsi Masisi of Botswana; Dr. Tedros Adhanom Ghebreyesus, director-general of the World Health Organization (WHO); Alexander De Croo, deputy prime minister of Belgium; David Beasley, executive director of the World Food Programme; ambassador Ertharin Cousin, board director of The Power of Nutrition; and Peter Sands, executive director of the The Global Fund to Fight Aids, Tuberculosis and Malaria.